No, we’re not talking about the long winters of Westeros, from the Game of Thrones series; we’re talking about how many days are left to build in 2014. Just last week snow fell in Calgary, Alberta, Canada, quite early and unexpected for the city. As it gets colder outside, it becomes difficult for the construction industry; the ground hardens, snow falls and workers slow down due to the cold. Each year Guard-All receives a flurry of orders between September and November as our customers try to stay ahead of the coming winter. 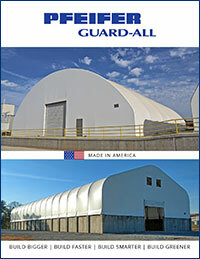 While Guard-All has the manufacturing capacity to produce thousands of square feet of buildings each week, our capacity is booking up. If you have a project you need in place, contact Guard-All today to find out how we can help get your project completed. You don’t want to be left out in the cold.